In this film, director Kenjiro Fujii provides an intimate portrait of the filming of "Bright Future", directed by Kiyoshi Kurosawa. Fujii takes the "making-of" film to a higher level and creates a unique documentary offering an insight into the art of Kiyoshi Kurosawa, the filmmaker. 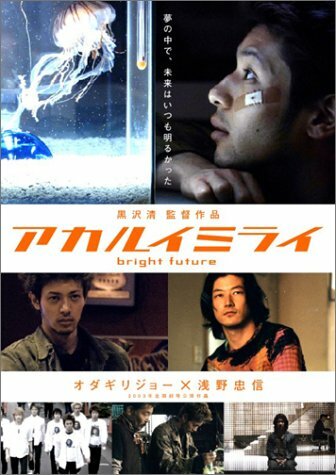 Naturally, this film features behind-the-camera scenes from "Bright Future", which unfolds in a low-key manner unimaginable for conventional film production. Of even greater interest is the image of Kiyoshi Kurosawa that emerges from the testimony of those involved in "bright future", including actors, producers, and Michiko Kitamura, costume designer for this film. And of even greater interest still is Kiyoshi Kurosawa himself candidly discussing his approach to his filmmaking. It is not difficult to imagine the effort that must have been required to coax these comments from the director. As a record of the Japanese filmmaker currently attracting the most international attention, this is a valuable piece of work.